Nepal, besides facing the health problems as any other country, also has its own specific difficulties in solving their problems. While there is a huge mass of unfinished agenda to deal with, newer challenges are emerging. They need to be faced from diverse sectors & angles. In any strategy to cope with health problems, production of appropriate human resource is the common denominator and cannot be avoided. Therefore more important is to produce adequate number of mid-level health workers needed at almost all levels of health care delivery system. In this context, initially a few people of the college management committee embarked in the enormous task of health education for the country. Later this initiative grew into establishing a college named "Vinayak College of Health Science". Able to face the 21st century challenges in the health profession. Possess strong sense of social responsibility. Loving and caring with compassionate. Willing to continue lifelong learning. Our vision is to deliver health education of the highest quality to meet the needs of individuals, academic institution, health institution and the national as a whole through widening participation and by raising the intellectual, academic and practical achievements of young people and adults in Nepal, by providing skills, knowledge and qualification as well as by facilitating the ethical norms and so1cial responsibilities. VCOHS has the education philosophy that the learning and teaching of health science becomes meaningful and refine their knowledge base whenever needed, and the student have scientific attitude towards the knowledge base, understand and accept the principal of evidence based practice. In order to achieve this goal, the VCOHS has the following educational strategy. System based integrated approach of basic sciences. More emphasis in practical exercise. Enough practice in students learning center. Self directed student- centered learning etc. TSLC Lab Assistant (18 months). It is a technical college of technical manpower to pursue technical education. 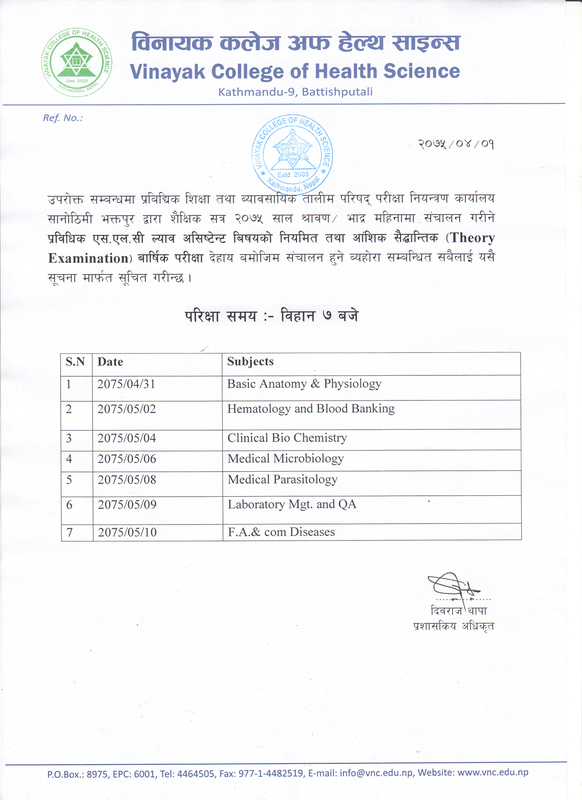 This is quite an established college affiliated with Council for Technical Education and Vocational Training (CTEVT) and recognized by Nepal Nursing Council, Nepal Pharmacy Council and Nepal Health Professional Council. More, if you are thinking to get a good learning environment and probably the best quality teaching by well experienced teachers (i.e., pathologist, doctors', readers & professors), who are reputed in governmental and non- governmental medical colleges and universities, Vinayak College could be one of the best for you. The college is private, operated under its own specified rules and regulations. 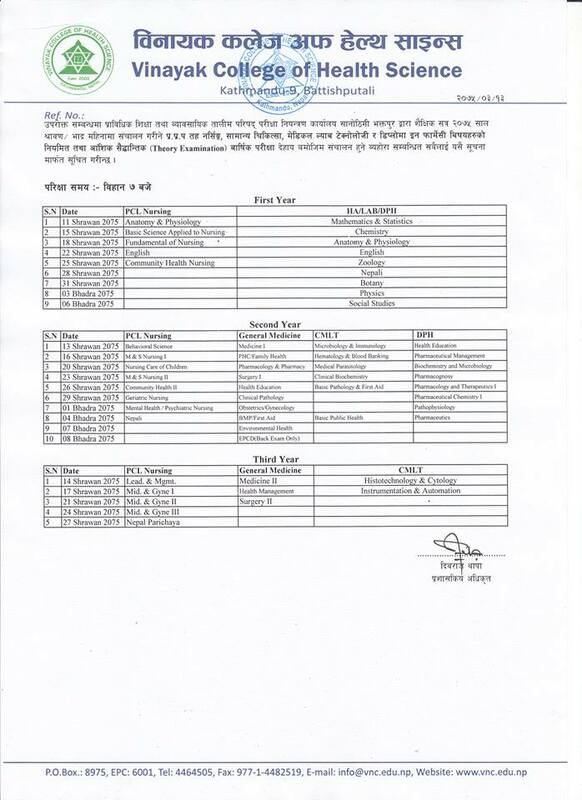 However, the academic activities are performed under the rules and regulations of CTEVT, Nepal Health Professional Council, Nepal Pharmacy Council and Nepal Nursing Council. We are committed to applying the principles of Health Education in our programs. We will continue to strive to give our students every opportunity to progress and achieve the highest educational potential within their chosen career path.